In 1862, American painter Eastman Johnson (1824-1906) made trips to Union encampments to witness and sketch the war's events. Throughout the war, African-American men, women, and children escaped slavery by fleeing to Union encampments. Union commanders referred them as wartime "contraband," or property forfeited by the rebellious Confederates. Johnson's few surviving depictions of actual episodes from the Civil War include his painting A Ride for Liberty—The Fugitive Slaves, which he described as having been "seen by myself at Centerville, on the morning of McClellan's advance towards Manassas, March 2nd, 1862." By the end of the war, nearly a million ex-slaves were under some kind of federal protection. 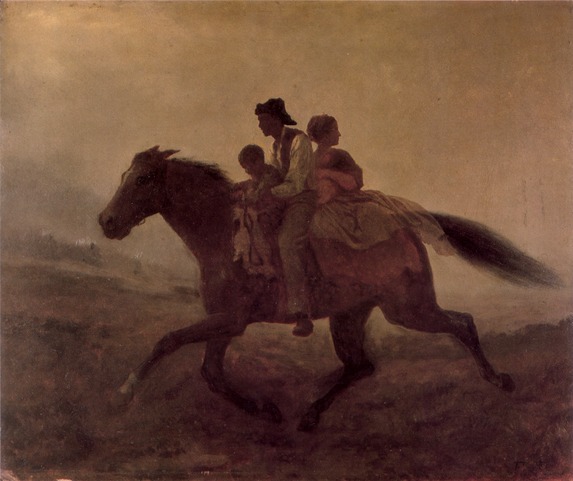 Source | Eastman Johnson, Ride for Liberty--The Fugitive Slaves, 1862, oil on board, Brooklyn Museum, http://www.brooklynmuseum.org/opencollection/objects/495. Rights | Used by permission of the Brooklyn Museum. Cite This document | Eastman Johnson, “A Ride for Liberty,” HERB: Resources for Teachers, accessed April 20, 2019, https://herb.ashp.cuny.edu/items/show/1026.